an intensely pruritic skin eruption on the sides of the digits or on the palms and soles, consisting of small, discrete, round vesicles, accompanied by pruritus, a burning sensation, and excessive sweating. It is a self-limited condition usually lasting a few weeks. A vesicular or vesicopustular eruption, of unknown cause, chiefly involving the volar surfaces of the hands and feet; self-limited but may be recurrent. /pom·pho·lyx/ (pom´fo-liks) [Gr.] an intensely pruritic skin eruption on the sides of the digits or on the palms and soles, consisting of small, discrete, round vesicles, typically occurring in repeated self-limited attacks. Acute vesicular palmoplantar eczema A condition common in warm weather, characterized by intense pruritus, possibly psychogenic, related to ↑ autonomic nervous system activity, with crops of palmoplantar vesicles and bullae, which may evolve into eczema. See Factitious dermatitis. Although the cause is unknown, emotional stress, an allergic predisposition, and fungal infections have each been associated with episodes of the rash. Burow's or permanganate solution and potent topical steroids sometimes are effective. The rash tends to appear less often as patients reach middle age. 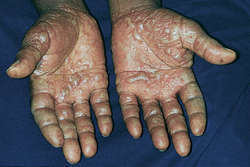 A form of acute ECZEMA in which itchy blisters occur on the palms of the hands (cheiropompholyx) and/or on the soles of the feet (podopompholyx). The cause is usually inapparent but there may be an allergy. Astringent lotions or corticosteroid creams may help. History of atopy was seen in allergic contact dermatitis (2 out of 25 cases), LSC (2 out of 11 cases), similarly in one case each of atopic dermatitis, pompholyx, prurigo nodularis and stasis eczema. 5 years which is comparable to that seen in most studies but the incidence of childhood eczema was very less in our study with only one child having pompholyx. Chougule et al (3) had noted history of atopy in 3 out of 29 cases (10%) of ACD which was similar to our result of 2 out of 25 cases (8%) and most of these cases had atopic diathesis clinically presenting as prurigo nodularis, pompholyx, atopic dermatitis and ACD to nickel sulphate. Pompholyx complanata Gosse, 1851 Trichocerca bicristata (Gosse, P.
Still, handy hints are always worth passing on, so to pompholyx, eczema's viciously itchy, blistery sibling. Rotifera TESTUDINELLIDAE BRACHIONIDAE Pompholyx triloba Pejler, 1957 Brachionus calyciflorus Pallas, Testudinella patina (Hermann, 1766 1783) B. Most common presentations were of discoid eczema and pompholyx. Polyarthra vulgaris Carlin, 1943 Pompholyx sulcata Hudson, 1885 Squatinella sp. The condition predisposes to or worsens diseases like fungal infections, contact dermatitis, pompholyx and pitted keratolysis. 1-18 Other morphological forms of eczema in descending order were seborrheic dermatitis, pityriasis alba, infective eczema, napkin dermatitis, contact dermatitis, and pompholyx. The secondary eruption may manifest occasionally as an erythema multiforme, urticaria, prurigo or pompholyx.